About "Message 100 Devotional Bible (Black Letter Edition)"
This Bible sets out the books of Scripture in chronological order, and integrates it with 100 devotional readings that help you slow down and take it all in. The original translation by scholar and pastor Eugene Peterson expresses God's Word with the vitality of today's English. This is a Bible to be savoured! :Experience God in new ways with this self-paced devotional reading Bible. The Bible was written over a period of 1,500 years. Now, with The Message 100, read the entire Bible in an order that reflects the unfolding of God's story. Through 100 readings, you'll see the face of God become clearer, providing a reading experience unlike any other chronological Bible. With today's hurried lifestyle, The Message 100 is a devotional reading experience that helps you slow down. Each reading begins with a brief overview, connecting you in to God's sweeping story. And the readings are long enough for you to become immersed in the story. Complete a reading in one sitting or break it up to allow time for reflection and prayer. God's word will come alive in The Message 100, and offer you something fresh and unique. 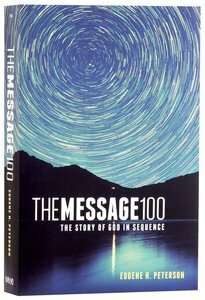 The Message 100 is a reading Bible translated from the original Greek and Hebrew Scriptures by Eugene Peterson. Thoroughly reviewed and approved by twenty biblical scholars, The Message combines the authority of God's Word with the cadence and energy of conversational English.